This was a week of high notes (bearing witness to the baby and fur-baby summit) and low notes (sleep, why has thou forsaken me? ), but mostly high notes. The most fun experience this week was watching Marlie get a hold of our dog Butters. She has been itching to touch him and finally got her chance this week when he lay down too close to her activity mat. She grabbed his leg, but he didn't growl or snap at her. He just got up and moved a safe distance away, LOL!. He came back a few minutes later and sat down face-to-face. It was like they were negotiating a treaty or plotting something, like how to get their hands on some real food. We've gone back to co-sleeping because her constant waking up at night was about to drive us both over the edge. She must have he developed immunity that one time we let her cry-it-out because she can seemingly cry without taking a breather. The only way to get a decent amount of rest is to let her stay in our room. Marlie-1 Parents-0. It's okay though because it's temporary. 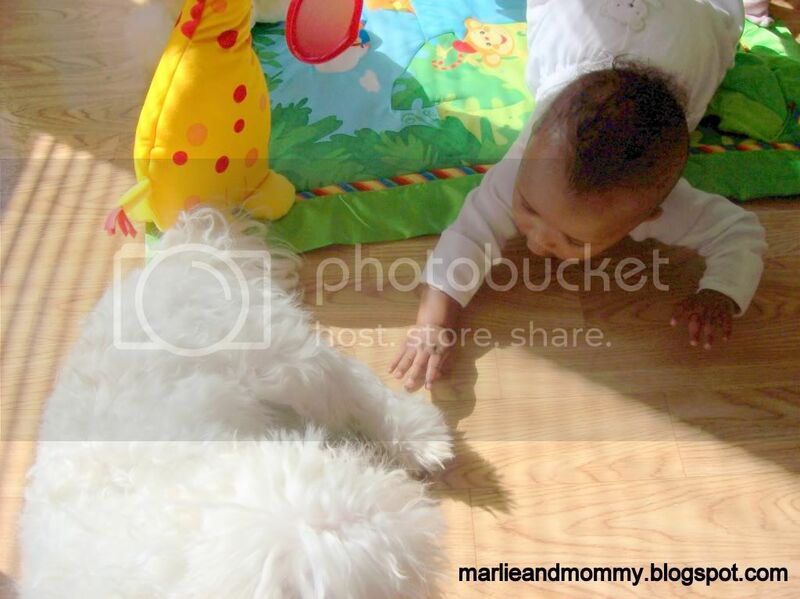 Keyalus turned me onto this very resourceful blog about infant development that explained a lot of Marlie's recent troubles (fussiness, night-waking, separation anxiety). Thanks girl! If Marlie needs her parents' comfort and reassurance during this developmental stage, so be it. Her gums are bothering her again. It looked like she had stopped teething at one point, but the itching an drooling are back. She loves to put any type of cloth material in her mouth to rub her gums, including my shirt. I won 3 bars of Creamery Creek Farm homemade goat milk soap thanks to Just Another New Blog. I picked lavender, lemongrass, honey almond oatmeal. I donated $10 to Partner's in Health and the Mayor's Fund to Advance NYC in support of the relief efforts in Haiti because of your comments on last week's baby log. Thank you! LOL! They do look like partner's in crime! Teething is such a pain (literally for the babies). Vivi is 16 months today and only has five teeth, yet has been teething non-stop since about 4 months. She drools and drools and drools and chews on things and chews and chews and then...nothing happens. Months go by...she finally gets one tooth. At this rate, she'll still be getting baby teeth when she's in high school. Literally, our doctor was just telling us that her daughter got her last 12 year molar when she was in 12th grade! That's fun that you won the soaps, they sound heavenly! I think watching dogs react around children can be just as interesting as watching the kids. :) Soon enough, they'll be in LOVE (mutually) forever. She is a total doll! The only sleep that happens around here is with the 20 month old in our bed, otherwise we are up and down all night long. I figure eventually she'll sleep in her own bed and I won't be able to drag her out of it to get up for school!